Recently, as I worked with some struggling math students, we spent a fair amount of time addressing gaps in prior learning. They were open to our classroom activities, so so it was interesting to challenge their thinking and observe their growth. For example, it was clear most of their previous discussions of relations and functions had focused on tables to the exclusion of graphs. So when we discussed the y-intercept by studying graphs along with their tables, new avenues were opened. I noticed something interesting using the research that led to my recent video about the Geometry Strand through middle school. During our classes, many students asked questions about the origins of the volume formula for a cylinder. 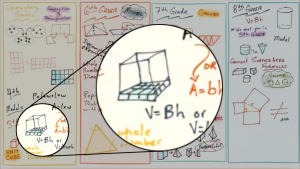 I would draw the image on the right and say, “back in 5th grade, you found the volume of a rectangular prism by counting the number of cubes that made up the bottom layer and multiplying it by the number of layers.” Every single student I spoke with said, “Yeah, we did do that.” Even those who started with, “I didn’t learn anything in 5th grade,” came around as soon as I talked about counting the cubes in the bottom layer. I think the most striking part of the conversation was when the students said, “yeah, we did that.” Not, “our teacher said that,” or, “I saw that on an anchor chart,” or, “we memorized that formula.” Because those 5th-grade teachers allowed these students to do that, the experience stuck with them — even as struggling math students — three years later.